The new Chief Executive of the Hong Kong Special Administrative Region (HKSAR) of the People's Repunblic fo China, Tung Che-Hwa, is sworn into office. 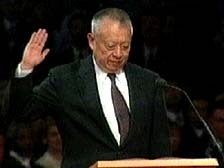 Members of the major departments of the civil service of the HKSAR are sworn into office. In order to maintain continuity, these department heads are mostly the same ones who served under former Governor Christopher Patten. 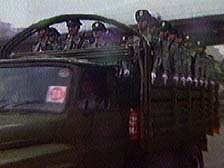 By dawn, truckloads of troops from the People's Liberation Army (PLA) have arrived in Hong Kong to take over the various garrisons and military installations located in Hong Kong. 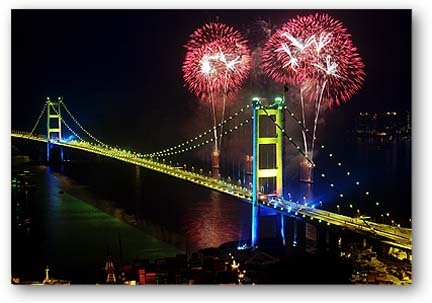 Fireworks lighted the morning up at the Tsing Ma Suspension Bridge (the longest road and rail suspension bridge in the world) and elsewhere to celebrate the handover.